Ms. Ewbank is a 1984 graduate of Northeast Louisiana University receiving a Bachelor of Business Administration degree. She received a Masters of Business Administration degree in 1986 and her J.D. degree in 1992 from Louisiana State University. Ms. Ewbank has significant experience in workers’ compensation defense and was formerly certified by the Louisiana Board of Legal Specialization as a Family Law Specialist. She is admitted to practice in all Louisiana state courts, the U.S. District Court for the Western District of Louisiana, the U.S. Fifth Circuit Court of Appeals, and the U.S. Supreme Court. Ms. Ewbank is a member of the Fourth Judicial District Bar Association and the Louisiana State Bar Association. 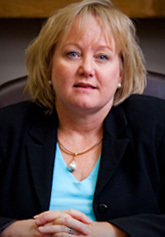 She handles mainly litigation matters, including general liability defense and defense of workers’ compensation claims. Ms. Ewbank is a Partner and located in the Monroe office.